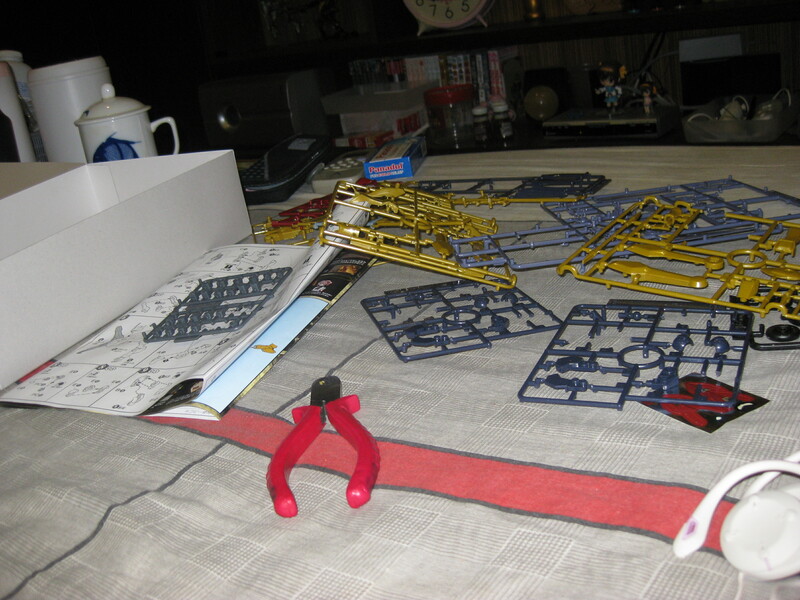 If you know me, you would know that I don’t really like model kits that much. 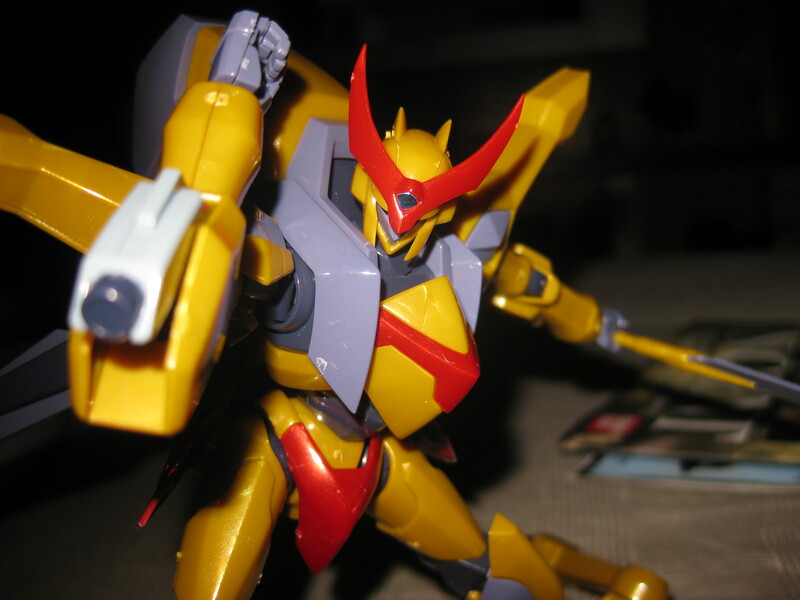 Compared to factory produced Completed Action Figures, models are usually of inferior quality when finished. Unless of course you are a professional that has all the relevant skills to produce a masterpiece. 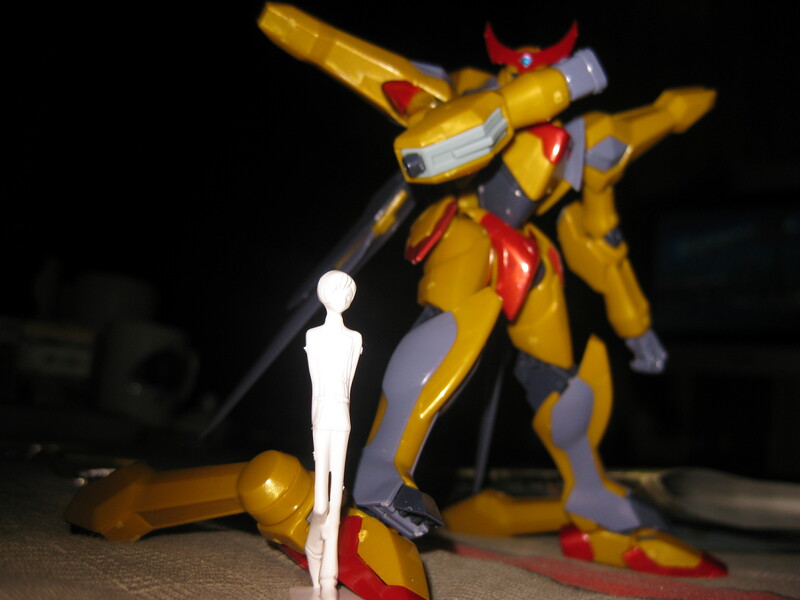 That being said, I have a few specific issues with model kits. 2. They are a hastle to complete. 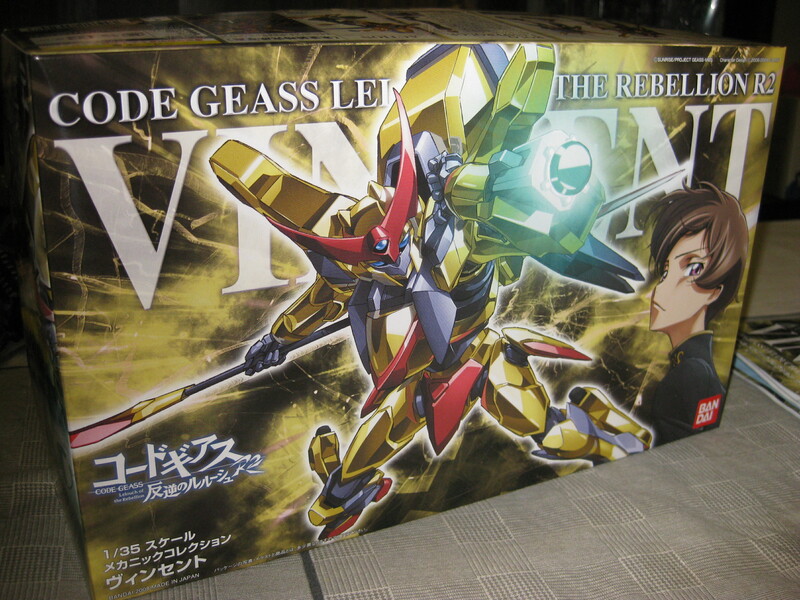 Now, what then, convinced me to purchase these Code Geass Models? 1. I’m a obsessed fan of the series. 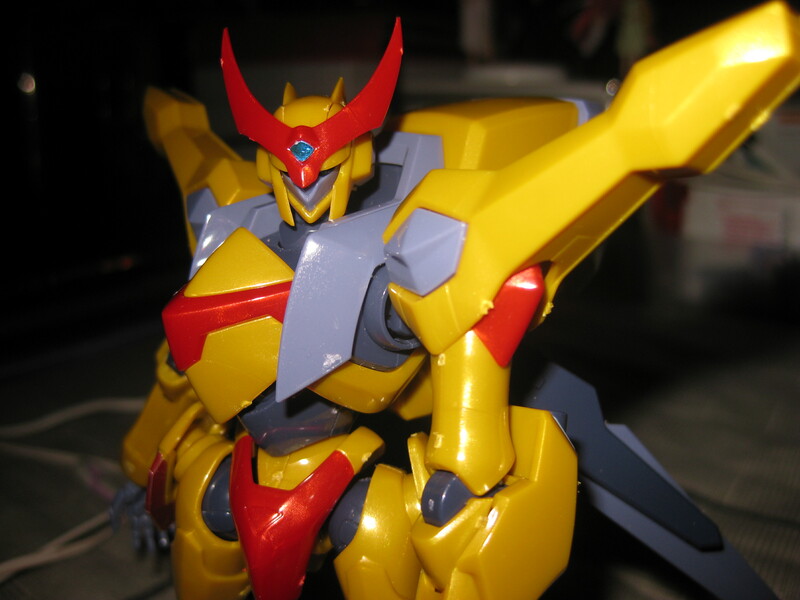 2 The colors of the Knightmare Frames are simple and thus, the models can accurately portray them with little effort. 3. 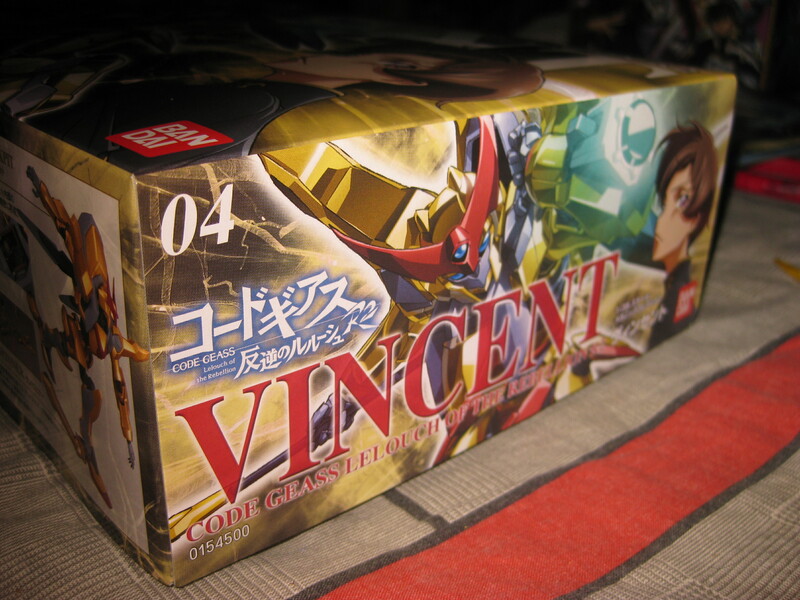 The Vincent does not have a Completed Figure counterpart. But I digress. I know you want the review, so here it is. 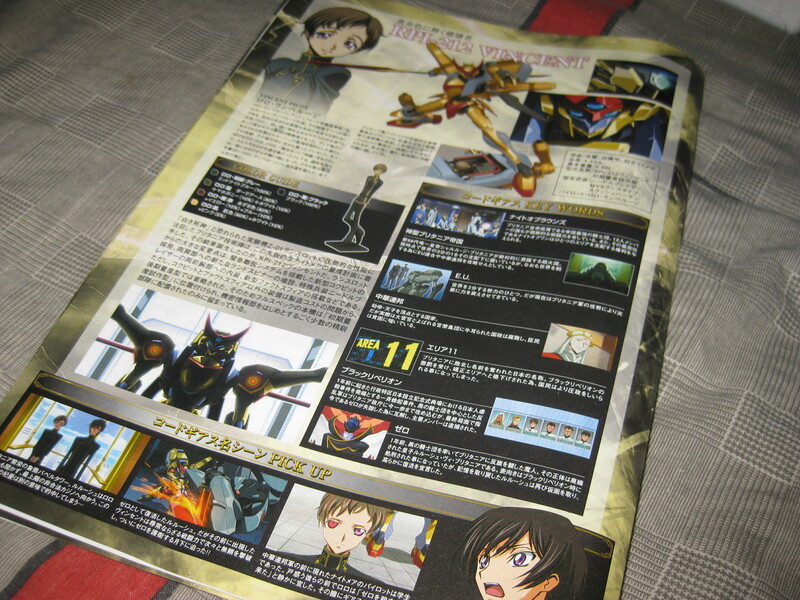 Just like the other Code Geass model kits (and supposedly Gundam ones as well), the sides contain a lot of information on the model, its features and the actual character itself. Notice that there are a couple of screenshots from the actual show accompaning the pictures of the model. This is to supposedly boast the model’s accuracy to the actual character model in terms of design and features. Lastly, I would just like to note that for models, they always take pictures of an expertly completed model. This means that the actual product would be considerably different, most noticeably the painted Rolo figure vs. the unpainted one that you get. 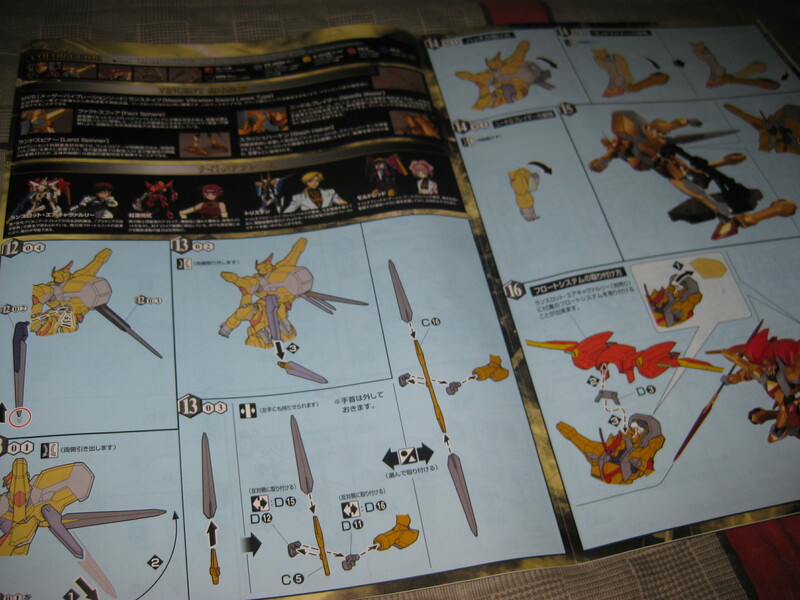 The right side of Side B (2/2) shows a picture of the actual model and its accessories. It is also great to see that the flight pack of the Lancelot Air Cavalry/Conquesta is compatible with the Vincent. 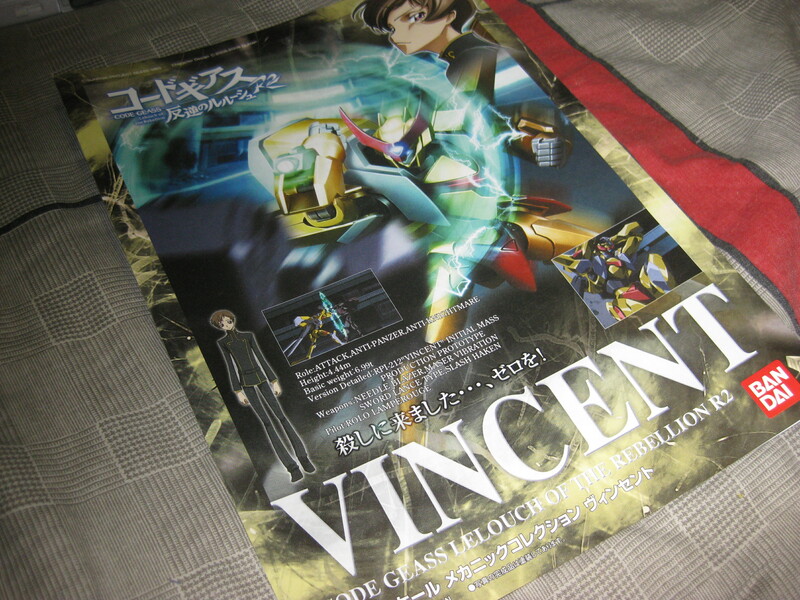 Sadly, the Vincent never uses that particular type of Float Pack in the Anime itself. 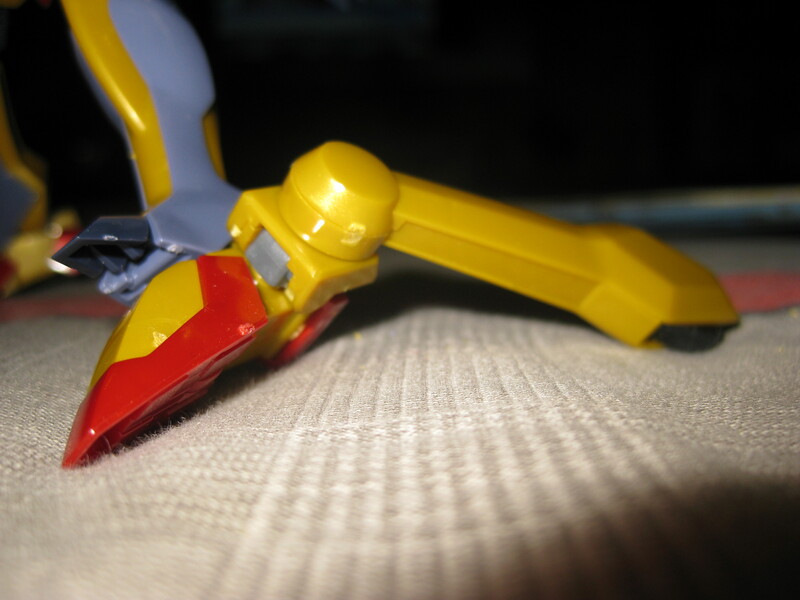 Pliers are used to get the pieces free from the runners (the frame thing). Though unconventional, I have discovered that Nail Clippers are really effective in removing those little bits of plastic that are left jutting out from the parts. If you know of any other more effective and efficient method of doing this, pleasetell me. Besides, Nail Clippers don’t remove the marks, just the extra plasic. Here are all the completed parts of the model. 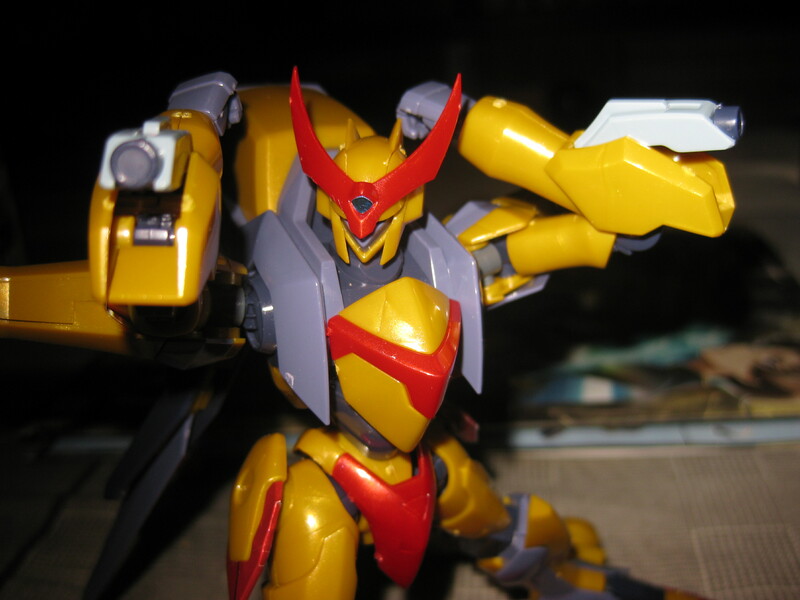 From here on, the model does start to resemble the Knightmare Frame that we all know and hate love. Personally, I like to work on every individual section and combine them at the very end in one epic moment. But that’s just me. 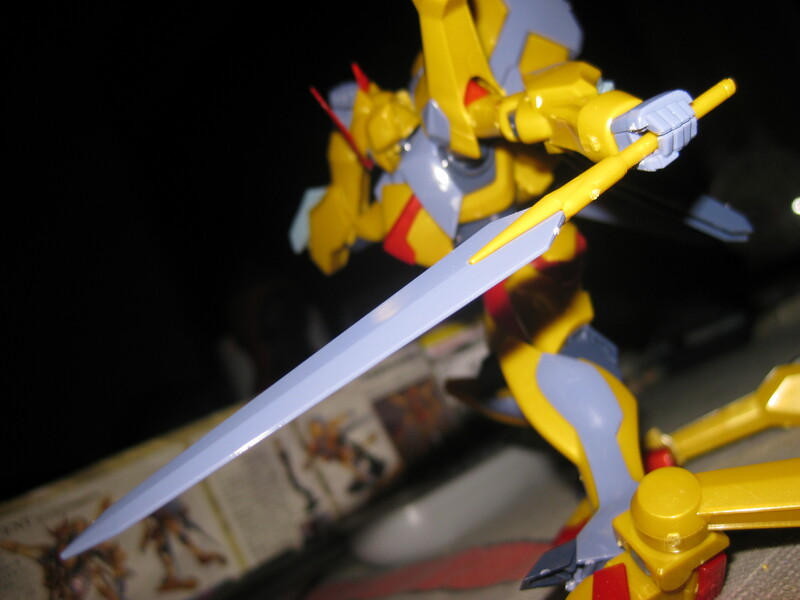 What a kick-@ss pose to start the ‘Completed Model’ section of this review off. 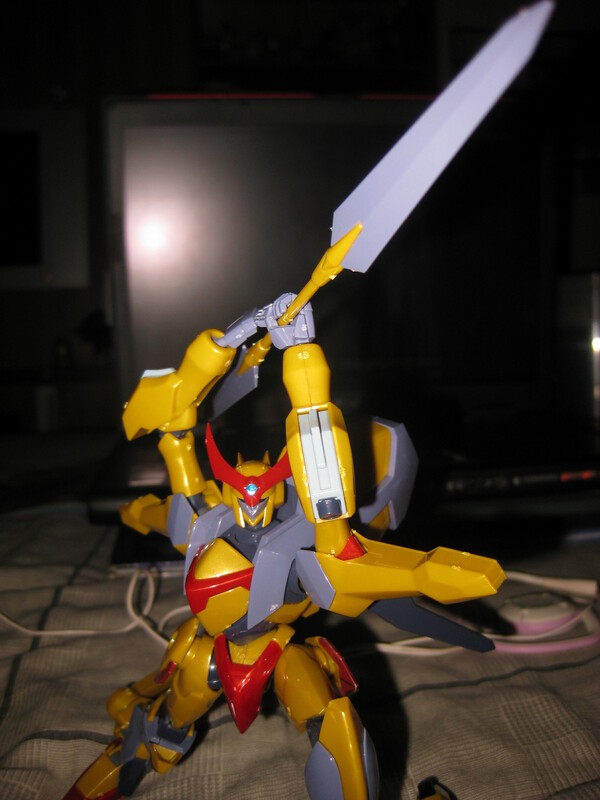 The picture above is indeed the very first one I took after I finished the model. It is plain to see that, although I tried my best, there are still numerous marks from where the pieces were attached to the runners. Oh well. 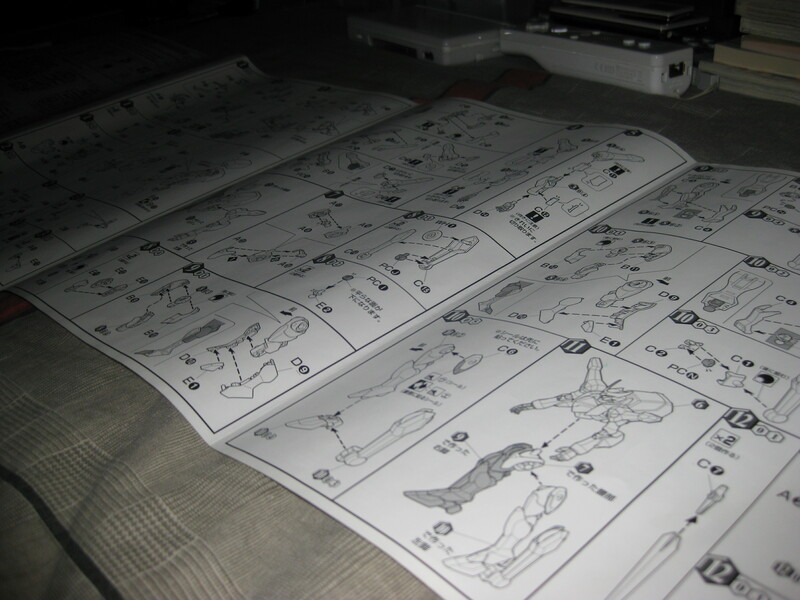 There are in total, 6 stickers that have to be applied to the model. Ever since young, I never liked stickers. They had a tendency to peel off. In this case, the eyes and jewel were not so much of a problem as they are pasted on to a flat surface. The Slash Harkens required you to fold the sticker all round the edges to cover up all the non-metalic Gold. Why they could not have included the Shash Harkens as separate red pieces I’ll never know. To save costs? Maybe. Before taking a look at the KMF itself, let’s take a look at that Rolo figure. 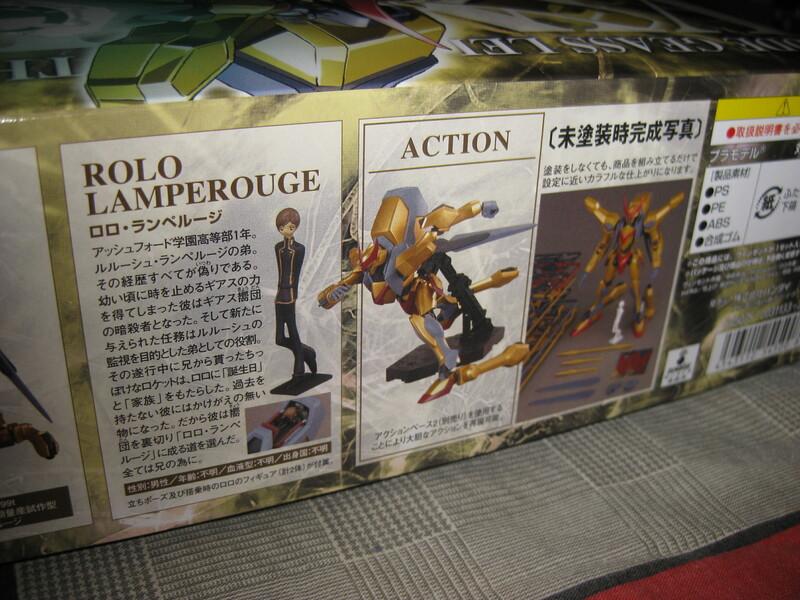 There are two Rolos that come with this model. One of him standing and one of him sitting. These mini figures are supposedly an accurate representation of how large the KMF would compare to a human. A little paint would have been appreciated though. Both of the Vincent’s hands are equipped with a Needle Blazer. These weapons deliver a huge amount of electricity when slammed into an opponent. The back door of the cockpit is openable. From there you can see the back of the pilot’s seat. It would have been great if the seat could be pulled out like the In Action!! Offshoot figures. I guess that that would have required quite a bit of redesigning. 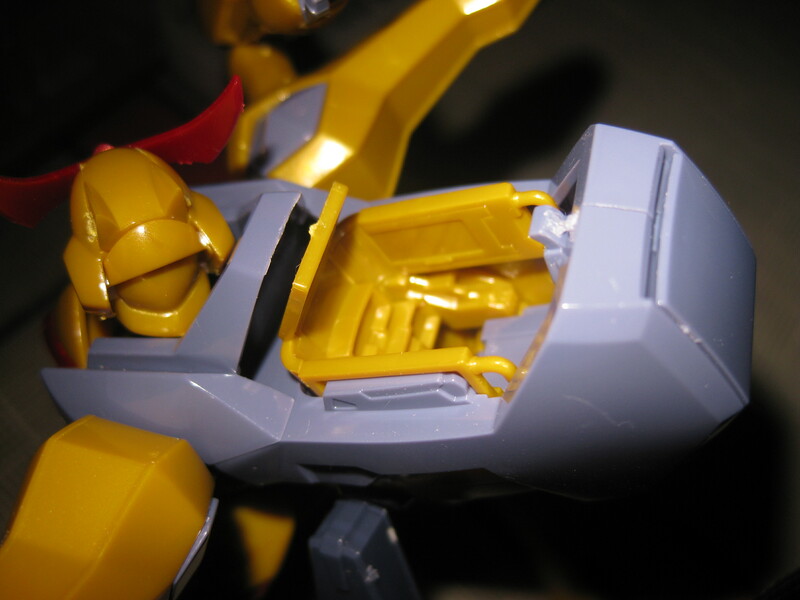 The top of the cockpit opens to reveal the interior of the cockpit and to allow the Lancelot’s Flight Pack to be connected. Although it may not seem like it, the cockpit is really detailed, showing all the three screens, handles and controls. Again, once this is painted, it would look 100 times better. …and here’s the sitting figure of Rolo piloting the Vincent. 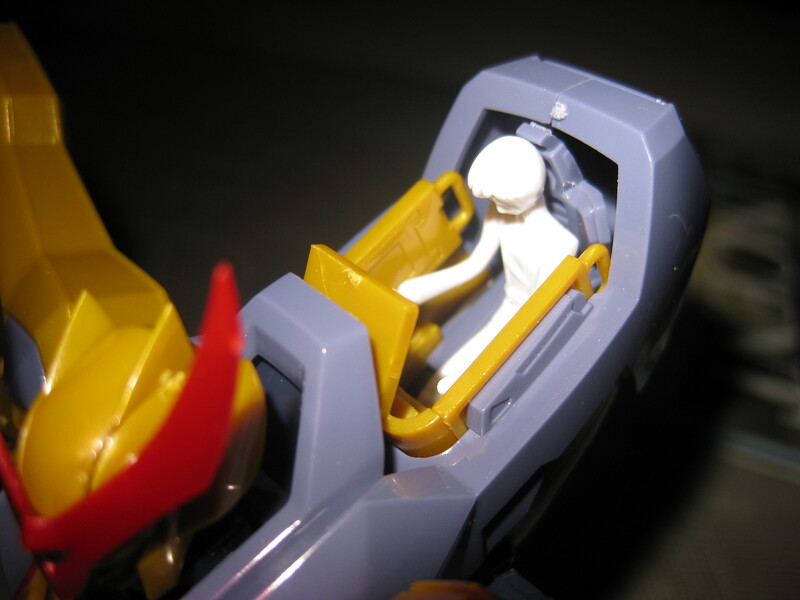 Yes, the cockpit can be closed with the figure inside. Sadly, Rolo’s a little bright and blurry in the picutre. White things are so hard to capture. Unique to the Knightmare Frames are the Land Spinners. Giant wheels that serve to enhance speed, agility and balance. They are double jointed and can move up and down/outwards and inwards. Another thing to note is that the wheels are made of rubber and can spin freely. Swords stored under the cockpit. I do like it that the swords have to be removed just like its Anime counterpart. The handles are made so that they have to be flipped out, like they are in the picture above, before being pulled out. Big points there. Although there are two lance handles provided, only one will be needed. 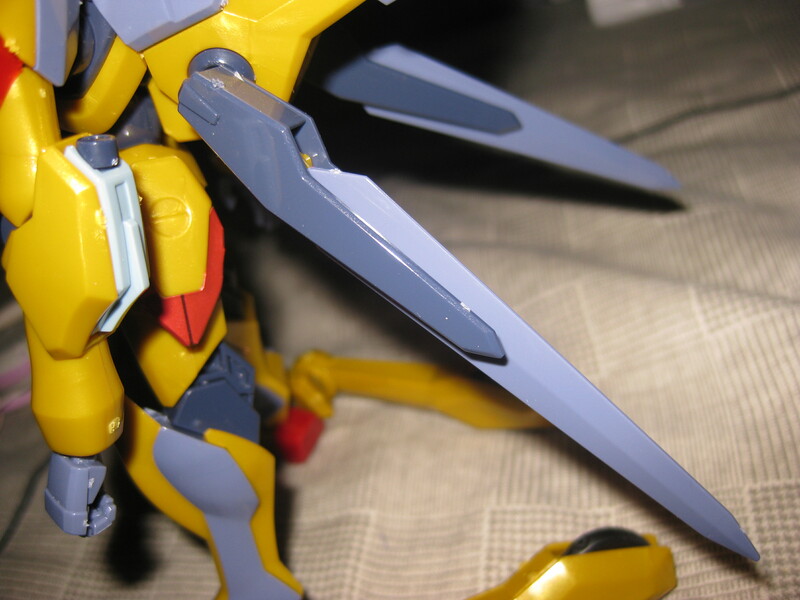 The grey blades are supposed to be the sword’s inactivated mode. It would have been nice if another pair of MVS Blades were inlcluded that were cast in red to show them in their active mode. I love this model, I really do. Besides being easy to make, it is relatively accurate to the actual character design. It has fantastic features and accessories. There is a new version of the Vincent model available now. 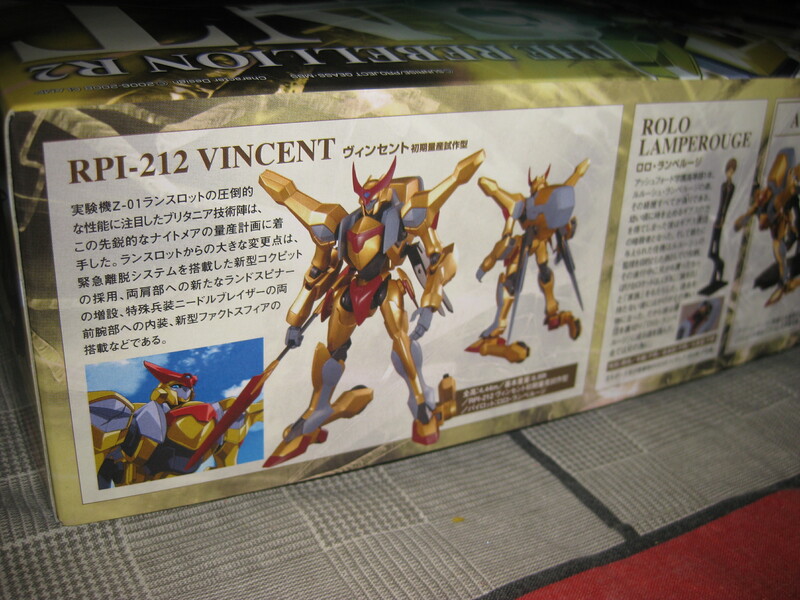 That is the Vincent Royal Coating Version. 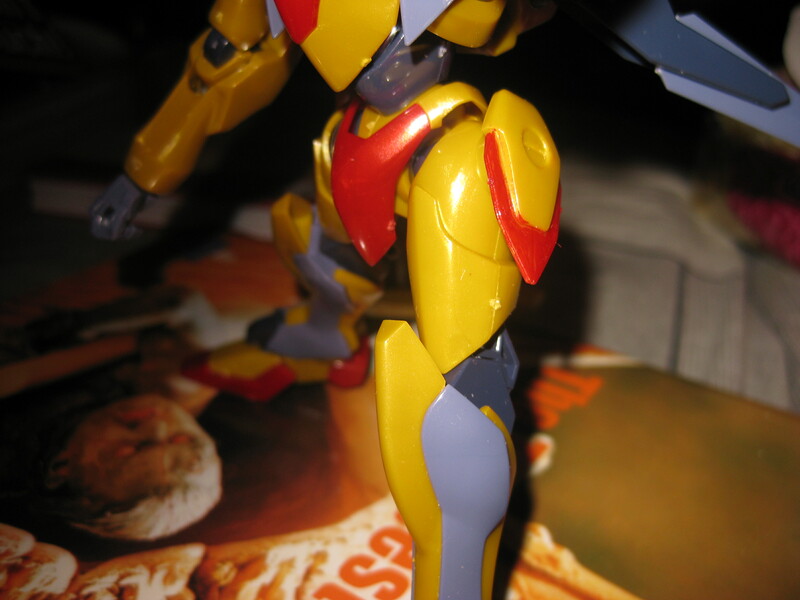 The Royal Coating is the chrome on the Gold parts of the model. 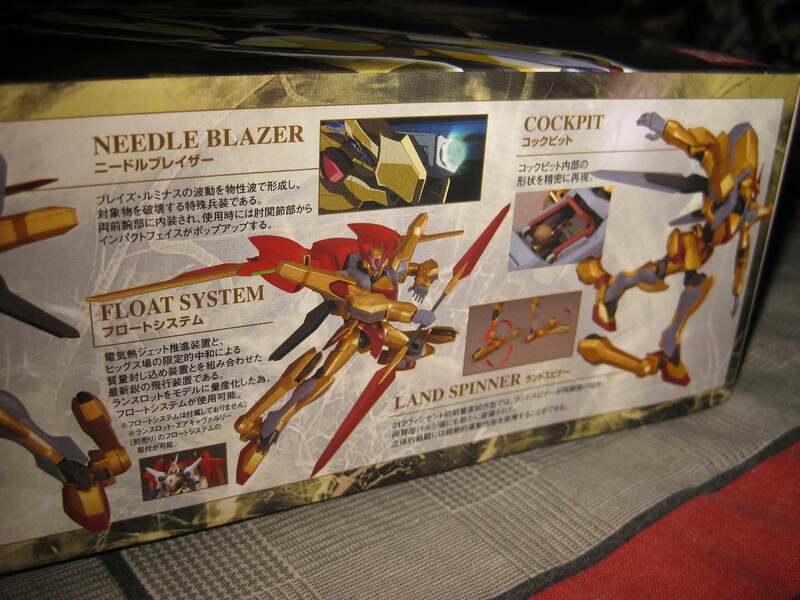 That looks awesome as they did not make the whole model chrome, but only the Gold parts. If you had to get a version, get that one. 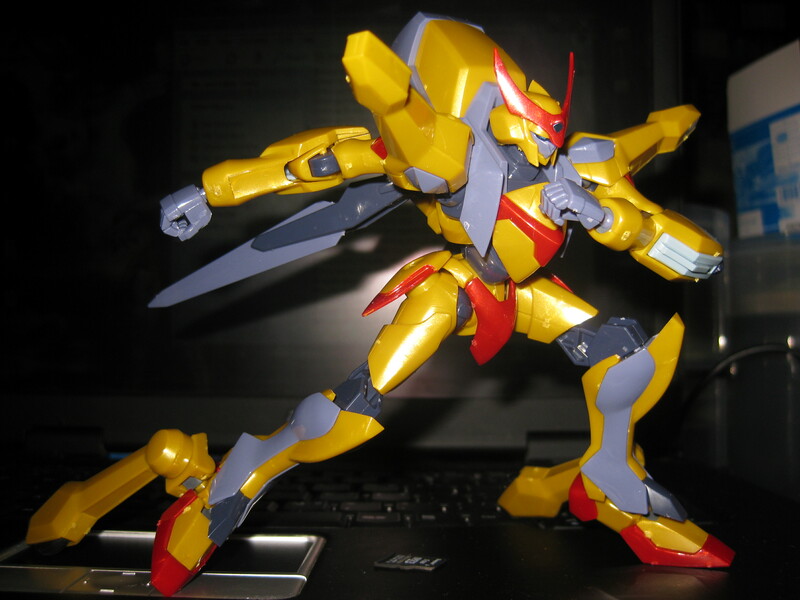 Otherwise, this is a great model for Code Geass fans and Model fans alike. 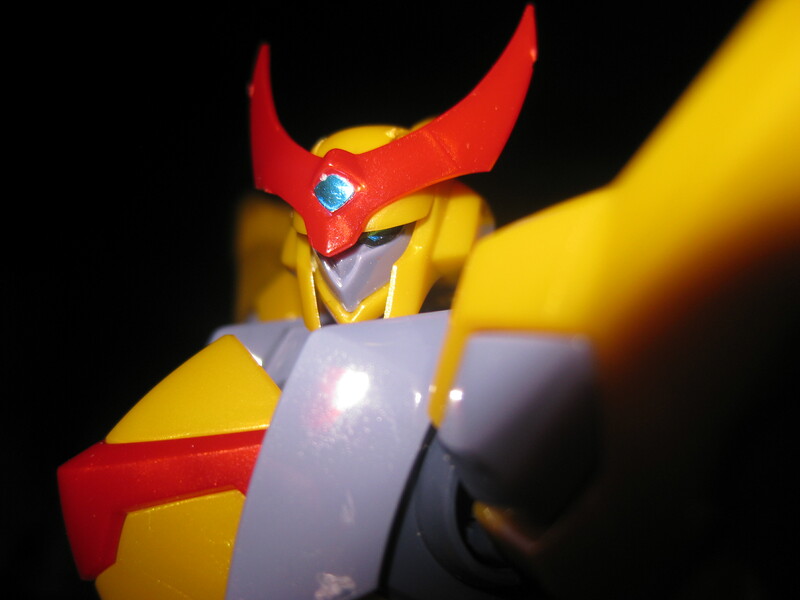 This entry was posted on Tuesday, October 21st, 2008 at 12:32 pm and is filed under Figure Photo Reviews, Figures, Merch and Stuff. You can follow any responses to this entry through the RSS 2.0 feed. You can leave a response, or trackback from your own site. 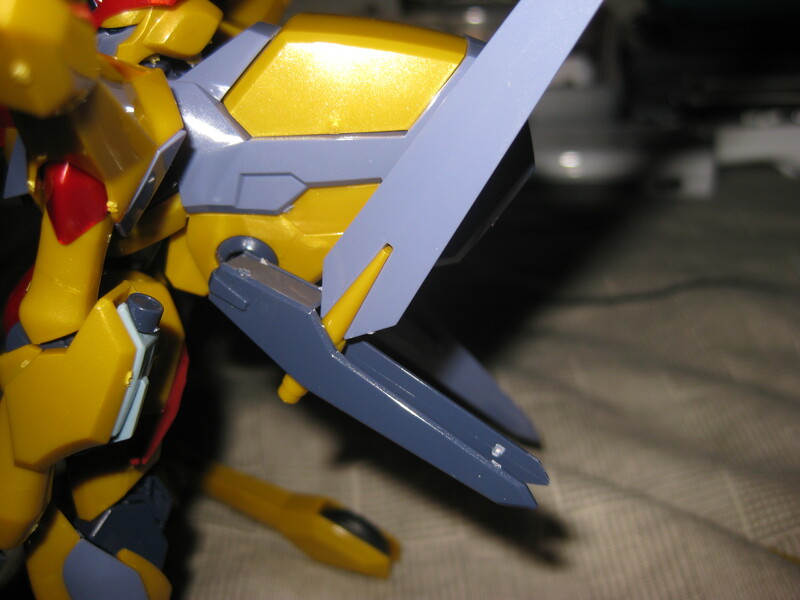 1) Use a Bandai Gundam nipper, rather than a nail cutter, it’s 100x easier. I know because when I first started with models i used a nail cutter too. 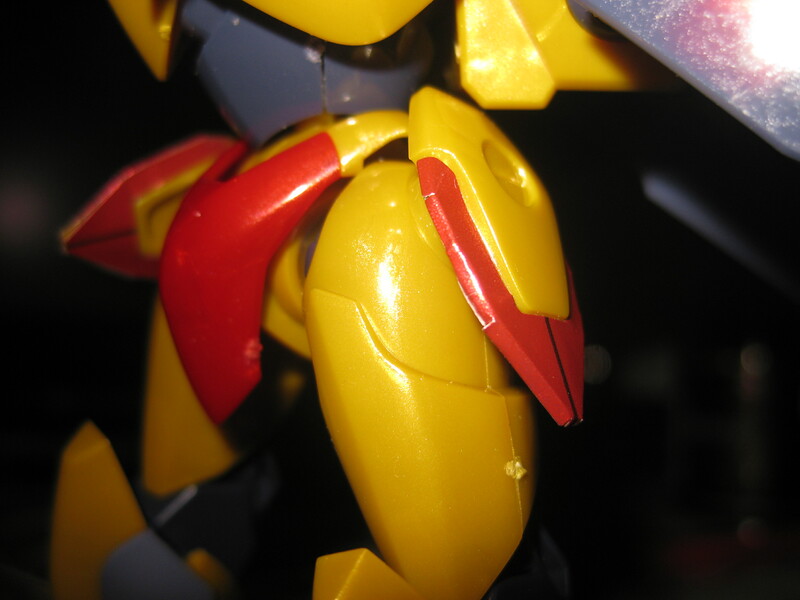 2) To get rid of the nip marks, the best way to do it (without painting) is to use the gundam nippers to trim the extra bit of plastic (called flash) but not all the way to the piece. What you then do is take a hobby knife and carefully shave the rest off. If you do it correctly, you should be left with a fairly unobvious mark. To get rid of it100% though, you will need to sand it smooth and paint it, but I find unless you paint it, the sanding mark is sort of visible as well. well i typed a lot, hope that helps you out on any future models…. Indeed, the first commenter is right. If you use a nail clipper, you tend to cause the white marks which look ugly if unpainted. 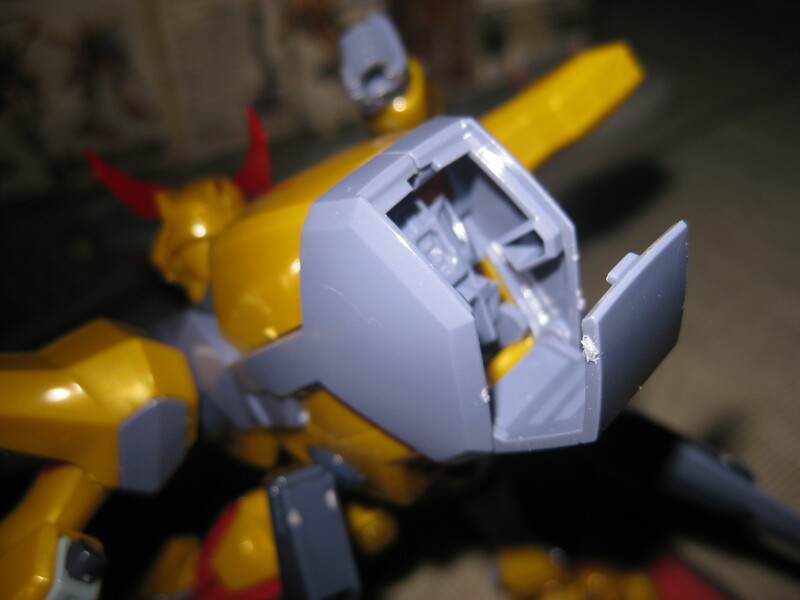 You’ll do better to sand it off after cutting it with any hobby cutters, not just Bandai ones. 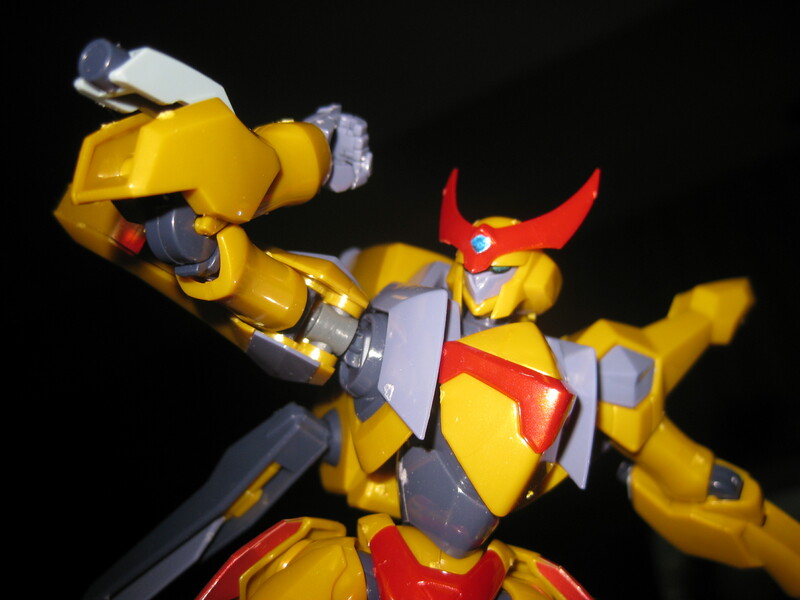 That said, I’ve like 5-10 model kits lying undone since 2004. Ugh. 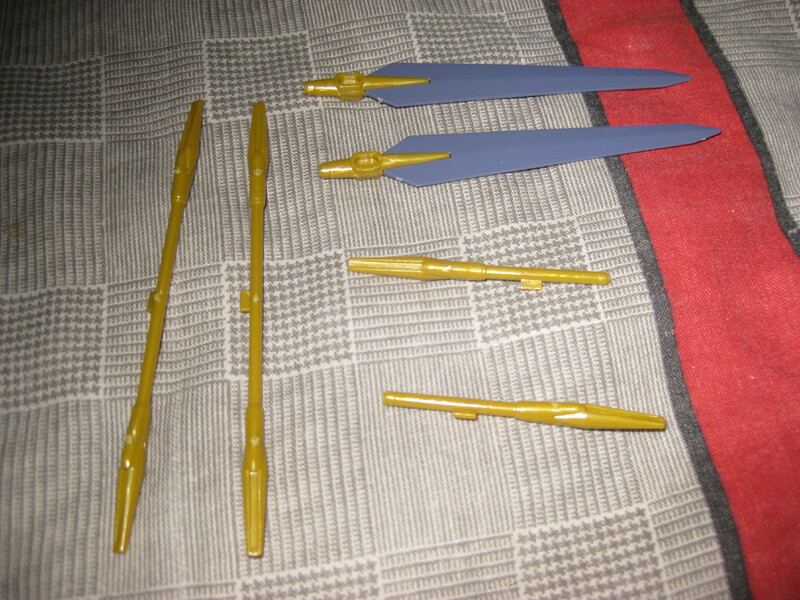 Hmm, also i highly recommend the Gundam nib pens for panel lining, they are easy to use and leave a realistic effect. 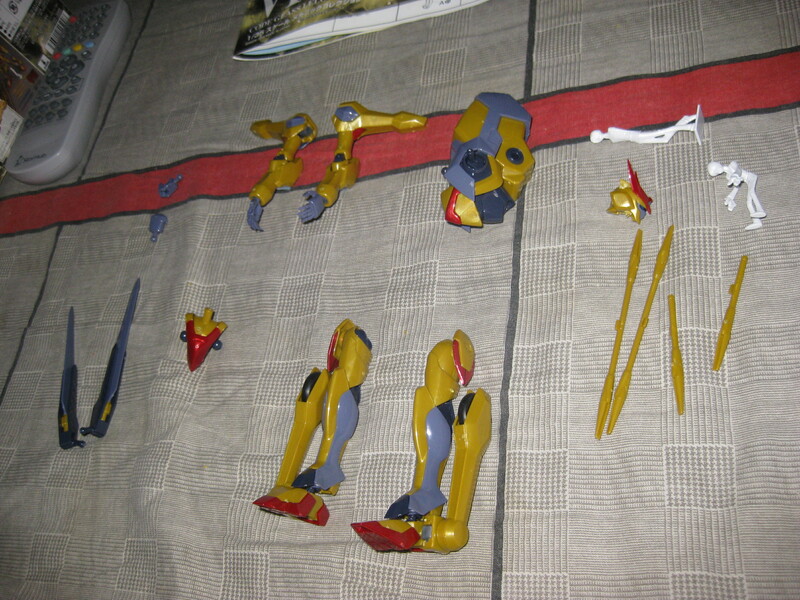 You did a good job, better than me.. i snapped the inner cockpit for my lancelot T.T. http://thelitepro.in/ Best Wear information source ! The friend recommended recently a good free web hosting, all the same the best service among the free! Hello, I have accidently stumbled upon this site while browsing around Google as I am looking for some information on engine lifts!. It’s a very interesting blog so I’ve bookmarked your site and I intend to return another day to allow more time for a proper read when I can give it more time. With plenty of beautiful pieces of Valentines Lingerie in the stores these days, there�s no excuse to get it wrong. I truly enjoyed reading through this article.Many thanks. While using opportunity with this post we would want to add our comment regarding logo design. We notice lately a portion of individuals having a automatic logotype creation solutions. A number of them are software programs created because of this or simply random ideas to enable them to create a logo set automatically. Even every website/business proprietor is the greatest person to understand the precise needs of his business, we would like to encourage people to find specialist through design agencies and logo designers. The costs can be extremely affordable plus the results stunning. The 1st look is vital and the ones should view it for investment rather than as a quick step they need to complete automatically. I recently got this model. 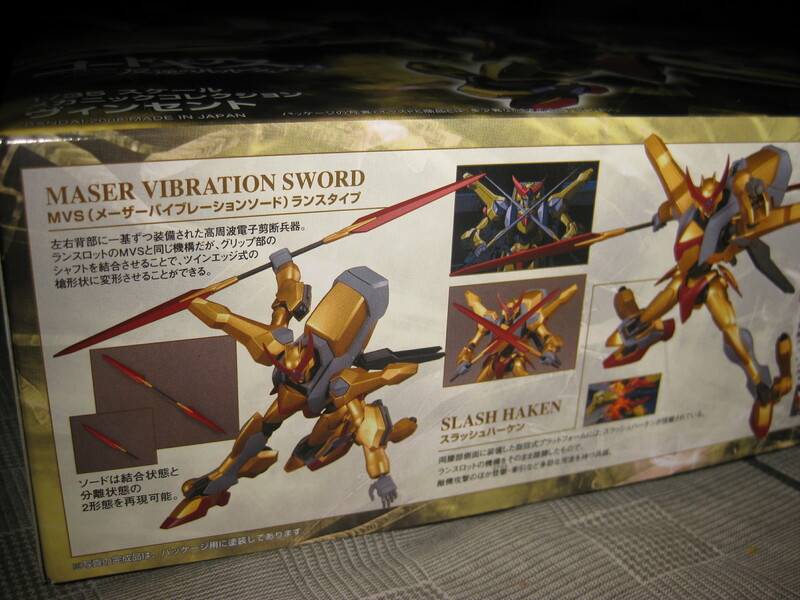 First off, I was disappointed that it wasn’t already cast in metallic gold, as I know there are models such as the Hyaku Shiki, which is already pre-chromed. However, seeing Acesan’s reply to this review, I’m glad to hear there’s an easy way to fix this issue. That said, I haven’t built the Vincent yet, because the first thing I noticed other than the non-metallic gold is… GPS (Gold Plastic Syndrome). I don’t know if the Vincent is vulnerable to GPS or not, but it’s kinda gold and there seems to be a lot of “stress marks” on the pieces. I dunno, I assume it doesn’t have GPS, since presumably, Bandai’s quite experienced with this kinda thing. But man, I’m thinking of selling him for cheap in case he does have GPS. Anyway, after reading this review, I’m wondering if I might not just build him anyway? Hello Dear, Nice website. I’m very happy to read your articles .